To better understand hearing loss, it’s helpful to know how hearing works. Most of us rarely give a second thought to this basic sense, but hearing is actually a surprisingly complex process that involves several important stages. The ear is made up of three parts: the outer ear, containing the external portion of the ear and the ear canal; the middle ear, which includes the eardrum and the a trio of tiny bones called the ossicles; and the inner ear, consisting of the cochlea and auditory nerve. All three work in conjunction with the brain to process sound. Sound waves enter the outer ear, and are funneled through the auditory canal to the middle ear. They cause the eardrum to vibrate and pass through the ossicles before reaching the inner ear. There, the sound vibrations cause fluid in the cochlea to move, stimulating the hair cells. The vibrations are transformed into electrical impulses and sent to the brain, where they are interpreted as sound. Ever wondered why an ear is shaped as it is? The shape of your ear ensures that sound waves are captured and directed through the auditory canal into your eardrum. 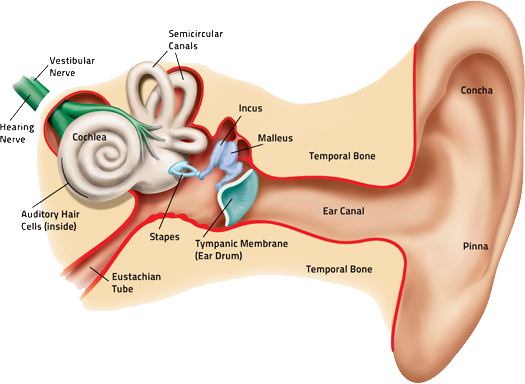 Three tiny bones and the eardrum make up the middle ear: The malleus, incus and stapes. The stirrup is actually the smallest bone in your body. They work together to amplify sound waves. Sound processing begins in the inner ear in the fluid filled, snail-shaped cochlea. Sound waves cause the fluid to move and that movement is picked up by the sensory cells that send the electrical impulses to your brain. Once impulses are sent to the brain, it processes the data so that we can select what is relevant to the situation and filter what is not.